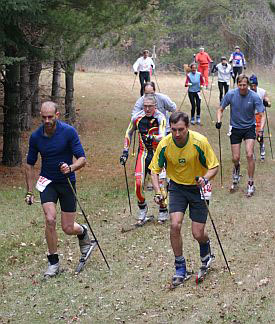 The CatSki is a Classical All Terrain ski, thus the name CatSki. The CatSki uses a system that is so innovative that it is patented. Click here to see how it works. The CatSki works on grass, asphalt, sand, dirt paths and pretty much any type of terrain you throw at it. It is as safe as walking and the best cardio vascular workout on the planet. If you are looking for one stop, all around cross country workouts, this is the product for you! Find out why Catski has become so popular among people world wide. The videos will provide further insight into the Catski and Catski technology. Our company is the leading manufacturer and distributor of the CatSki. Our one of a kind Catskis are essentially roller skis, but better - they are an innovative way to optimize your cross country workout by enabling you to ski on almost any types of surface. This product is a great investment for training when there is no snow or if you are just looking for a fantastic, complete exercise workout to get your body, heart and mind as fit as it can be. There is nothing better to get your blood pumping and your heart in shape than the CATSki. This CatSki can be used on your favorite ski trail all year round. A great workout going up hills and safe coming down. Builds strength much more rapidly than any other ski. Allows you to ski out your back door and across your back yard. These may seem as bold statements, but this is a bold ski. Some more bold statements about the CAT ski that were made by XC skiers. "I'd rather CAT ski than snow ski because I get a better workout." "Best invention since the wheel." "I got them, so I could train with my best training buddy, my dog." to order your pair today. Copyright 2009 Catskier.com: Cross Country Workouts. All Rights Reserved. CatSkis -- Classical All Terrain Ski!